An interesting large painting, full colour on paper mounted on a wooden frame, 25.5 in; 62cms in diameter showing a bust portrait of a beauty with elaborate coiffure and holding a hat for a street festival. Although not signed, the attribution is unquestionable, painted between 1767-1773 in Osaka. It appears to have been commissioned to hang in a hairdresser’s or cosmetic shop and has metal eyes at the top. 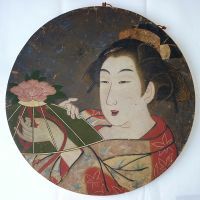 The oxidised silver leaf background was meant to resemble a mirror and the idea of busts reflected in mirrors and silver grounds was later employed by Utamaro and Sharaku. Besides silver, gum and raised painting is applied. 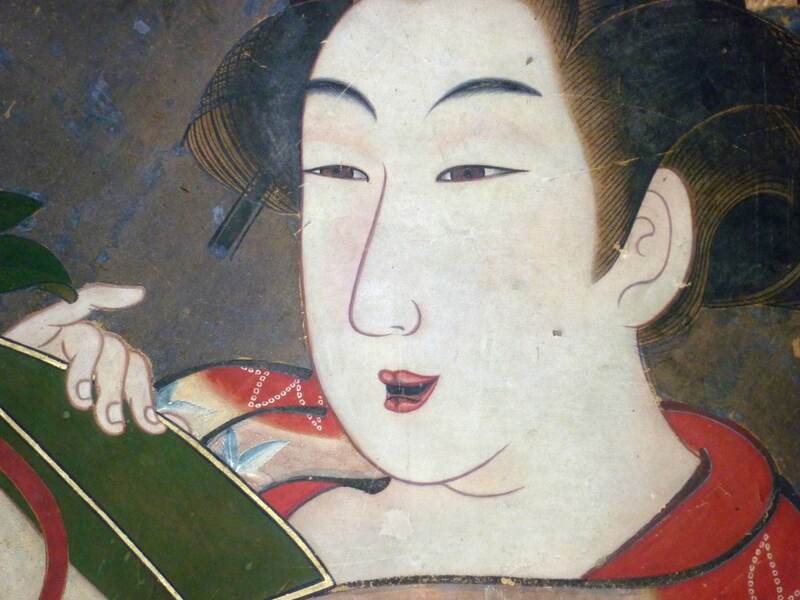 Such signboards appear in an illustrated book by Hasegawa Mitsunobu published in Osaka in 1752. This new discovery has been written about by Dr. Yamamoto Yukari in vol.27 of Minzoku Geijutsu (Ethno-Arts) in 2011. Minor surface marks all over but astonishingly good condition given their age and use. Extremely rare.